King Kamehaemeha statue at Ali’iolani Hale court building in Honolulu. Honolulu has Waikiki’s beaches, countless places to shop and many memorable things to see and do. However, you can experience some of the most historic parts of Honolulu on foot. 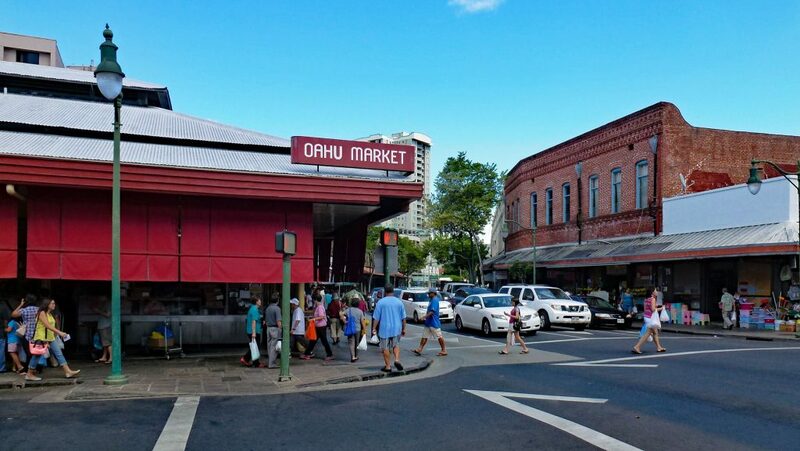 Below are walking tours of Honolulu where you can visit the city’s most historic locations. 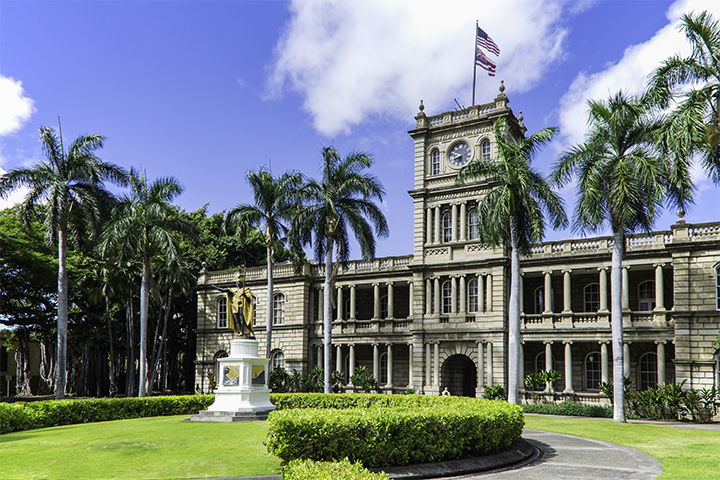 This is the only royal palace in all of the United States, making it one of Hawaii most unique places. Inspired by his trip to Europe, King Kalakaua commissioned the construction of the palace in the late 1800s. 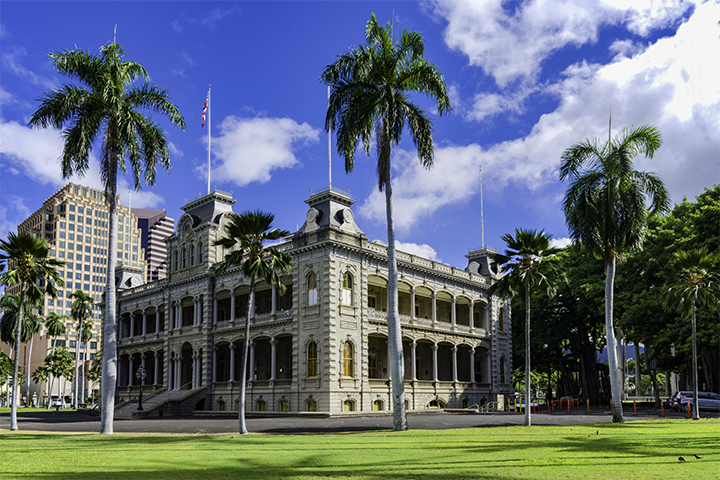 It was home to the last two official Hawaiian monarchs, King Kalakaua and Queen Liliuokalani. The grounds of Iolani Palace also have a picturesque gazebo where the kings and queens celebrated their coronation. You can visit the palace by purchasing tickets at the adjacent Iolani Barracks. The palace is open from Tuesday to Saturday. Part of Hawaii’s rich religious heritage, the Mission House dates back to the 1800’s. It was once a printing house, a storehouse and lodgings for the early missionaries to Hawaii. Hawaii’s ancient religious foundations drastically changed due to the missionaries’ influence on the islands. As a result, the Hawaiian kapu system of rules and laws began to decline. To gain a better understanding of this period, you can walk through the buildings to see relics of the bygone times. Also, you can wander through the auditorium and stop by the gift shop. Tickets for guided tours and general admission range from $6 to $10 per person. You can find this famous statue in front of the Ali’iolani Hale building. This is the home of the Hawaii Supreme Court and State Law Library. Ali’iolani Hale, featured in numerous film and TV shows, was built in 1874 and was originally intended as a palace. In front of this building is the majestic statue of King Kamehameha in striking hues of black and gold. The first Chinese immigrants to Hawaii arrived in the 18th century. Their numbers continually increased during the 19th century when they began to work in the sugar plantations. They congregated in small communities of family-owned restaurants and businesses, known from the 1870’s as Chinatown. This historic area of Honolulu has suffered fire, plague, war and crime. But yet somehow, it continues to be one of the most vibrant parts of the city. Visitors can explore the area, try authentic Chinese food, buy gifts or visit nearby temples. Statue of Father Damien at the State Capitol in Honolulu. While many governmental buildings may look uninteresting, Hawaii’s State Capitol Building is definitely not. The capitol has intriguing aspects that make it an important site to visit on Oahu. The building was designed to symbolize Hawaii. The mirror-like pools are the oceans surrounding Hawaii. While the legislative chambers of the building represent walls of a volcano. A statue at the front of the building honors Father Damien. He was the priest who gave his life serving lepers on the island of Molokai in the 19th century. 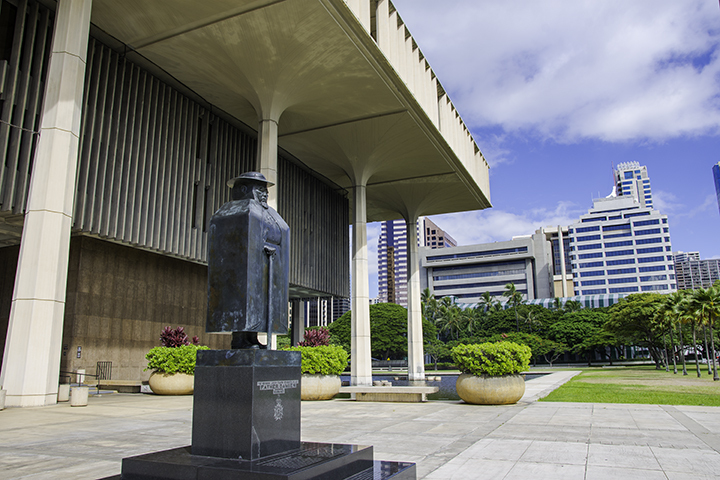 One cannot go on a walking tour of Honolulu without stopping at the State Capitol Building. Hawaii Maritime Center in Honolulu. 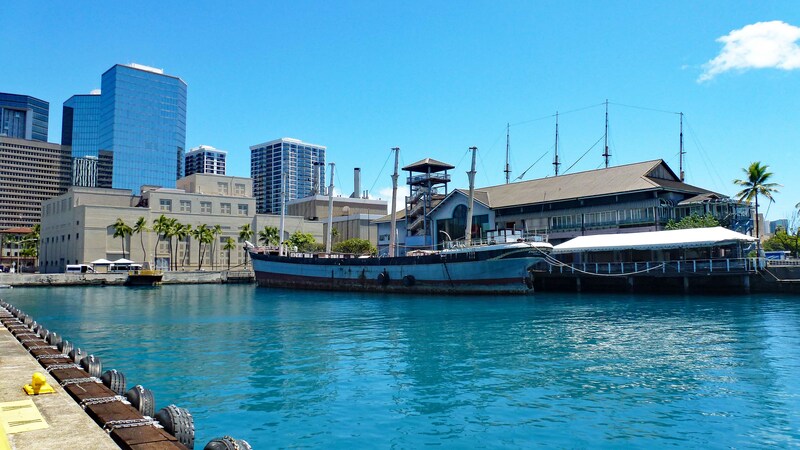 Located at Honolulu Harbor, the Hawaii Maritime Center tells the story of Hawaii’s enduring relationship with the sea. Whether you want to learn about surfing or about Captain Cook’s voyages, the Hawaii Maritime Center is a must-do. There is even a the skeleton of a humpback whale and exhibits on 19th century whaling. The Star of Honolulu with the Aloha Tower in the background. At the Aloha Tower, visitors can learn about the history of this beautiful historic landmark. The then Territory of Hawaii built the structure in 1926 as an aid to navigation for ships entering Honolulu Harbor. You can even enter the tower and take a small elevator its observation deck. Here, you can enjoy sweeping vistas of the Honolulu Harbor area. The Aloha Tower could be the perfect segue into a relaxing evening on the water. 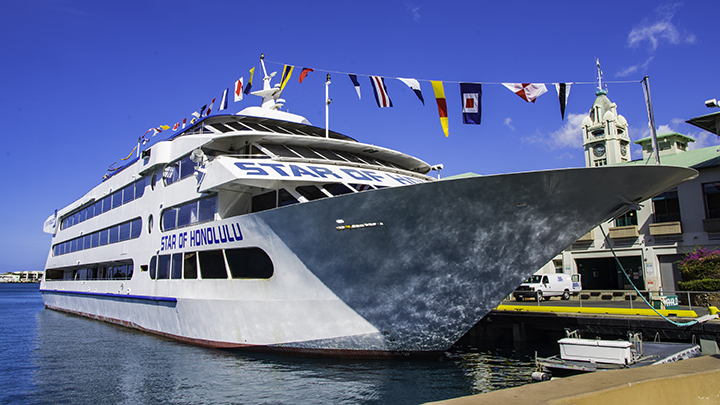 This is because the Star of Honolulu Sunset Cruise sets sail from the dock below.